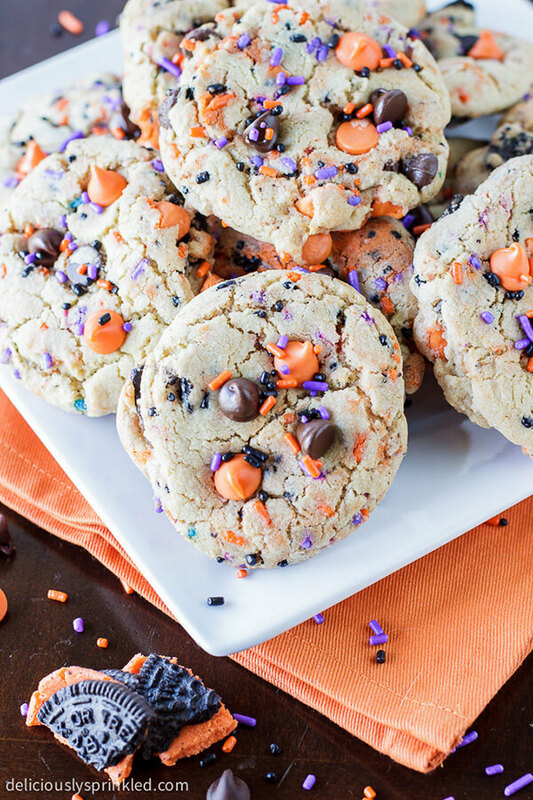 What’s Halloween without scrumptious Halloween cookies? Incomplete, right? Every year, people all across America bake fresh and succulent cookies to serve the little guests and trick-or-treaters. And those who don’t make cookies at home, stack loads of cookies in their home for the holiday. 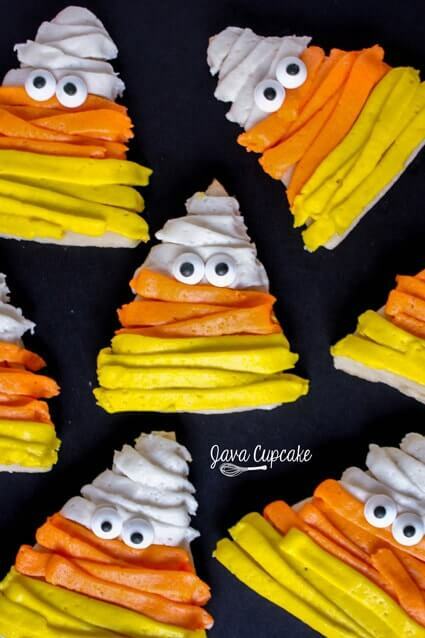 And with some strategic use of candies and creative icing tricks, you can turn the store bought cookies into the creepiest Halloween characters. 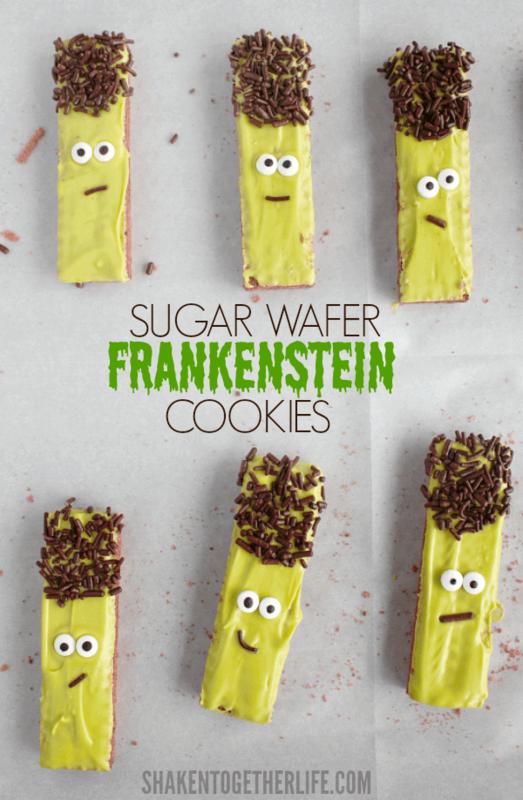 We’ll share the same ideas and a few more in our compilation of Halloween cookie recipes below. 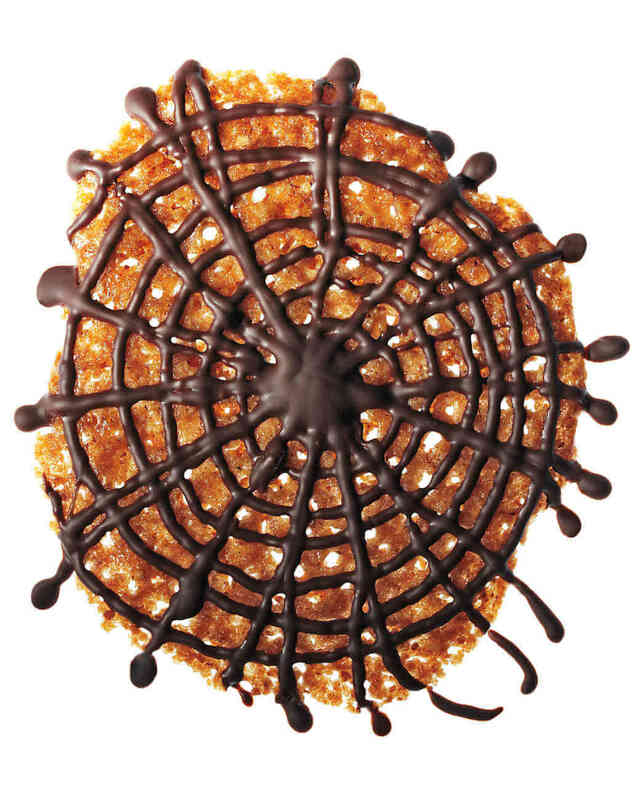 Give a spooky touch to lacy and delicate Florentines by making them look as spider webs. Just the proper heat of the oven will transform the dough into crispy cookies. Have mummies ever looked so beautiful and colorful? We really don’t think so. 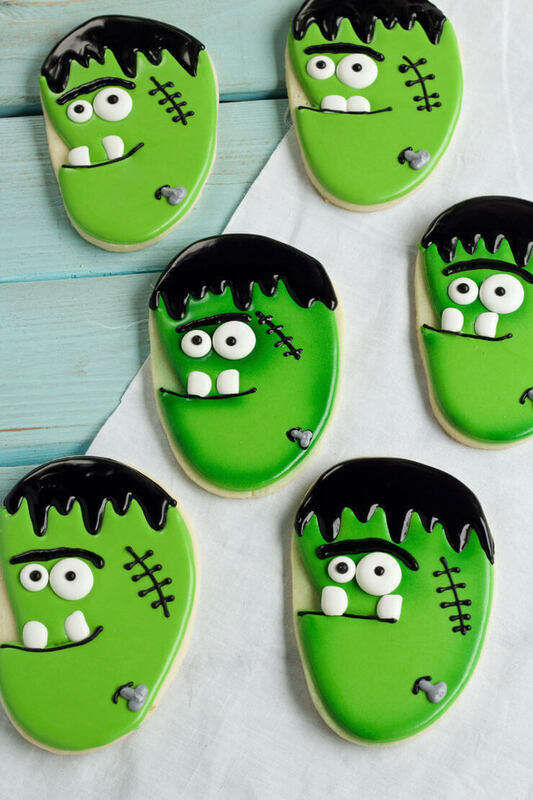 These cookies are so delicious that they’ll please even the scariest of children. These cookies may look complicated at first, but once you get a hand of it, you can easily create several batches of this beauty, err monster. 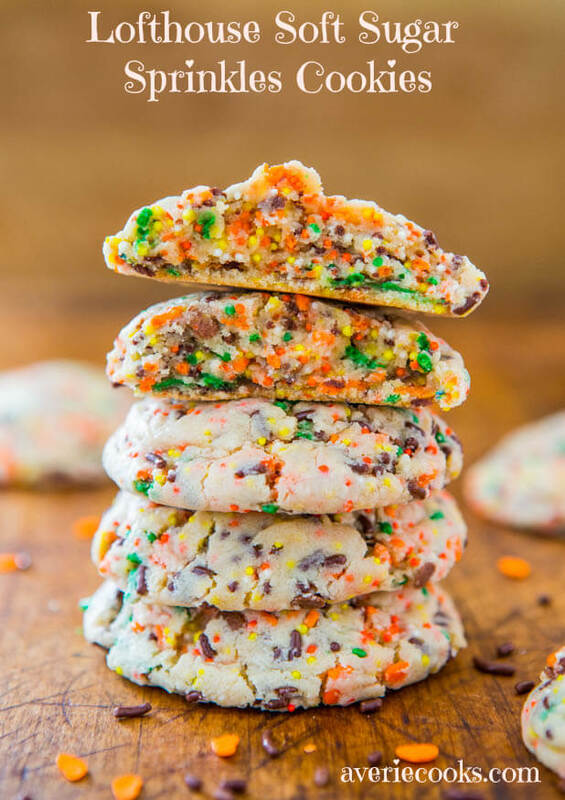 These thick and puffy cookies are made with M&Ms, peanut butter, sprinkles and then sandwiched together with marshmallow PEEP. This one’s gonna be a treat for children as you can hide all their favorite candies in it. 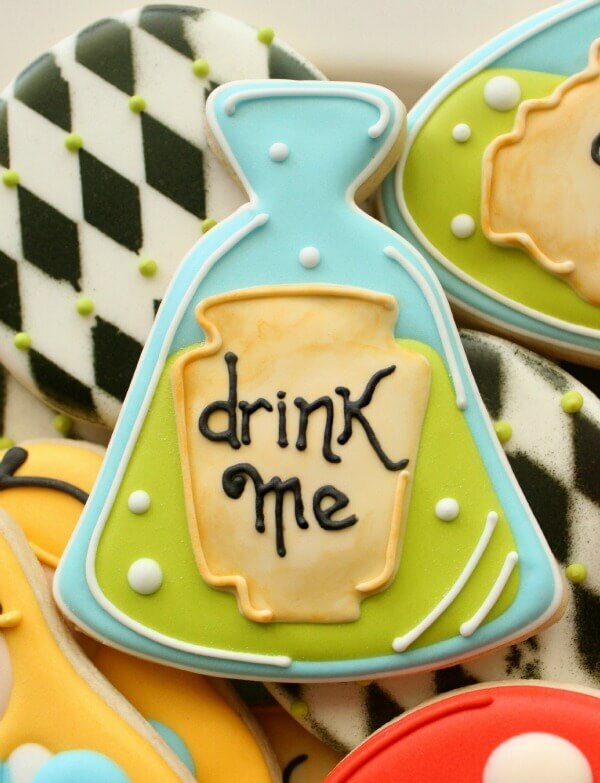 Don’t forget to imprint the cookies with a mat or anything you can arrange to give the cookies a wooden effect. We totally love these cookies for their uniqueness. The concept is distinctive and the color combination is unique. We’re sure they’ll taste good too! Who said you can bake gingerbread cookies only for Christmas? 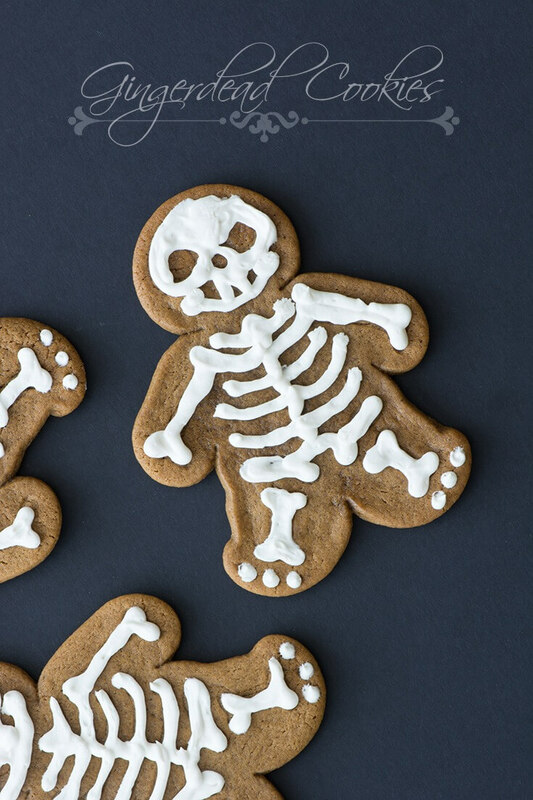 With some white icing you can create some Halloween friendly gingerbread or rather gingerdead cookies. Refer the recipe for more details. Here’s a mash, Monster Mash! 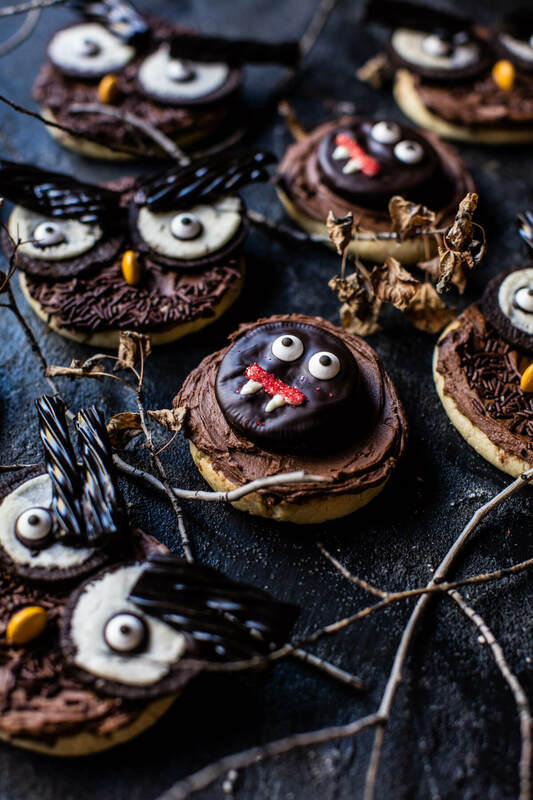 The cookies haven’t left out any spooky Halloween characters, be it owl or Dracula. And if you want, you can include bats too. Why purchase Oreos when you can create their cooler variation within the comforts of your home? Here’s one such recipe for your reference. Children are going to have loads of fun helping you makes these easy, no bake sugar cookies. Trust me, a batch won’t be enough. You’ll have to make a lot more to satisfy children’s sweet tooth. 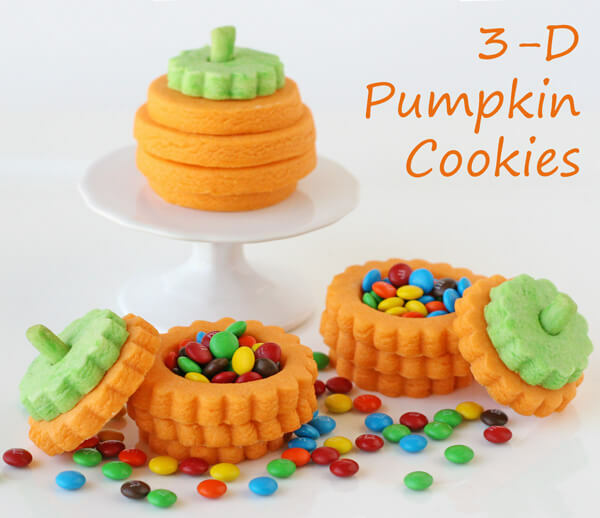 These fun and whimsical 3D pumpkin cookies, help together with icing will be a great surprise for children. You can fill them with whatever candies you like, with M&Ms will fit it best. Just three ingredients and a couple of minutes can give these incredibly delicious and decadent cookies. 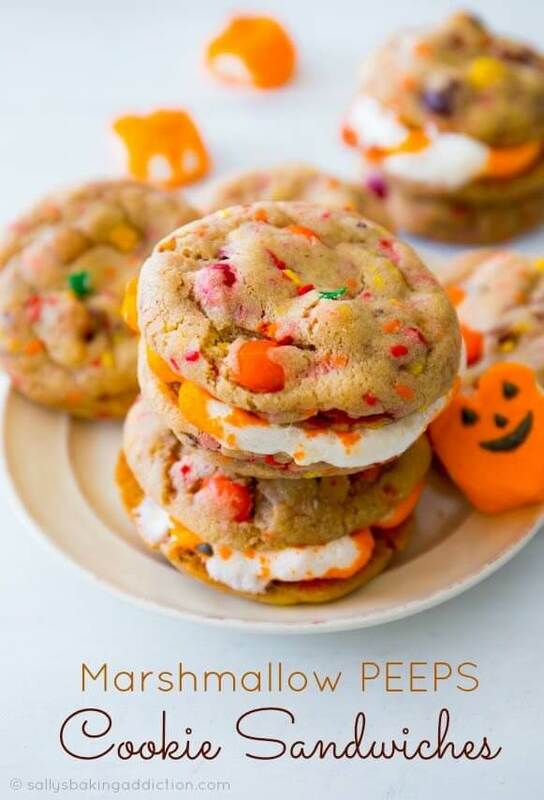 We think it’s a perfect Halloween cookie recipe for kids to make. 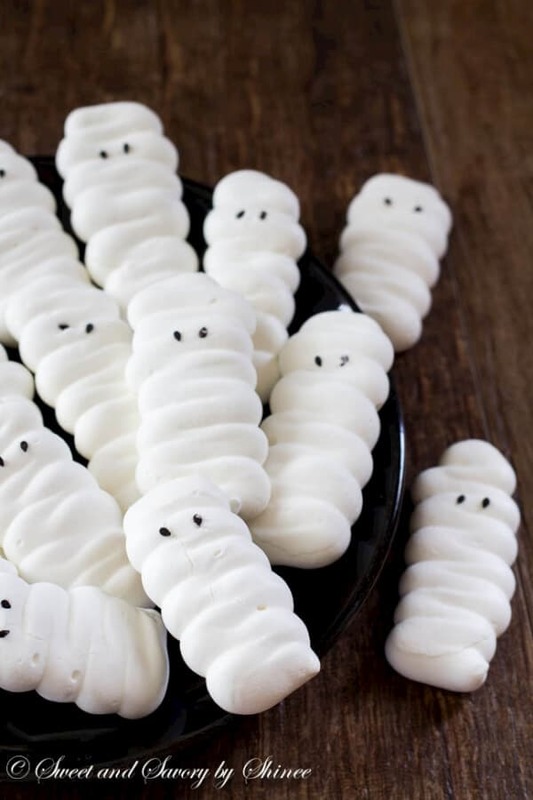 These are the cutest ghosts we’ve ever seen. And we love the fact that it’s so easy to make. Just cut out the cookies in ghost shape, smear white icing on it and make eyes and nose. The spiders are adding to the spooky effect. 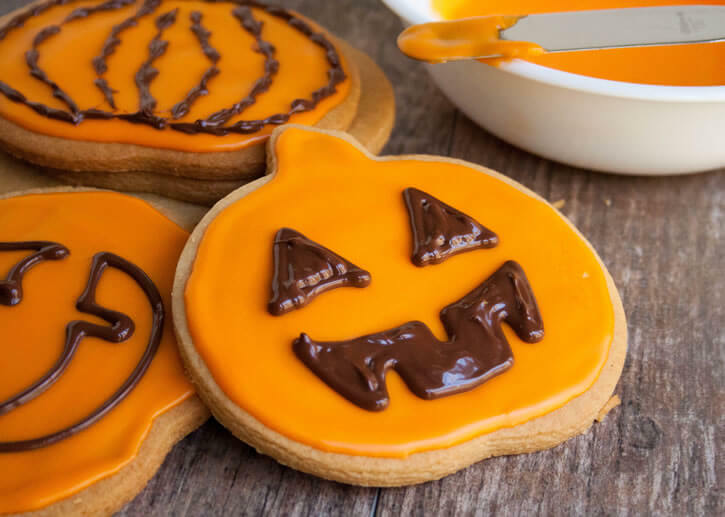 If pumpkin carving is a tedious job for you, you can try your hands at making these jack-o-lantern cookies. At least it won’t require too much effort. 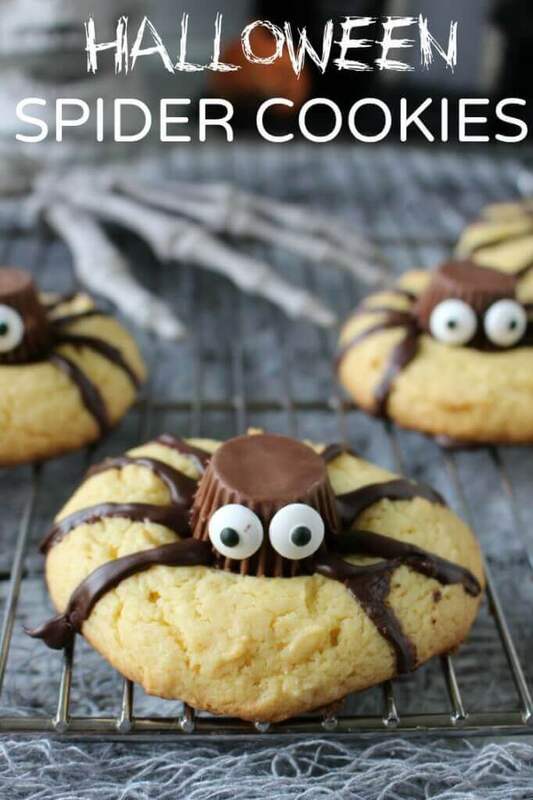 Spider cookies are totally hit during Halloween. It gives people ample of opportunity to experiment. 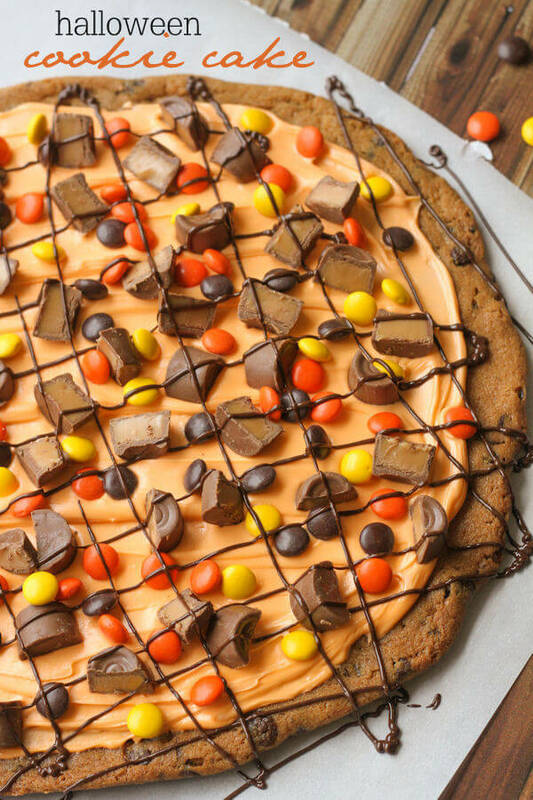 This one, made using Reese cups, will disappear in a matter of few minutes. These light and buttery cookies celebrate the color of Halloween. And believe me, they’re extremely delicious. 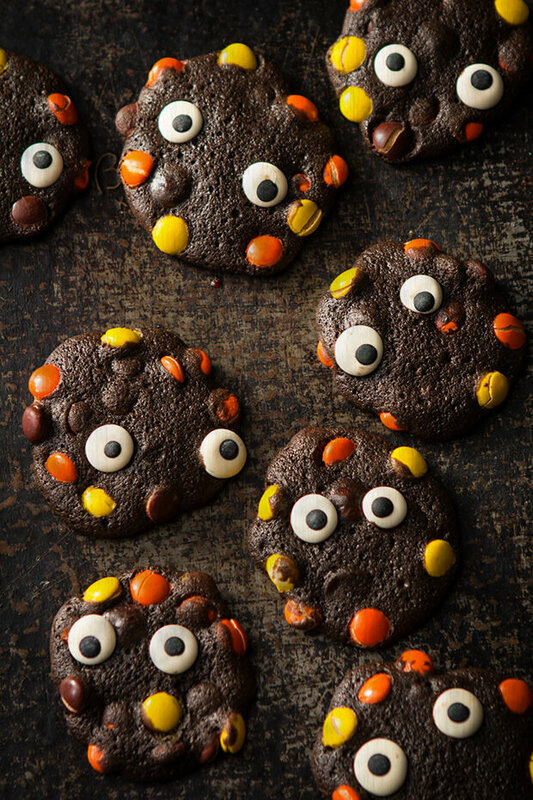 Here’s an easy peasy Halloween cookie recipe, which you can make using a few orange and yellow candies, royal icing eyes and double chocolate cookie. 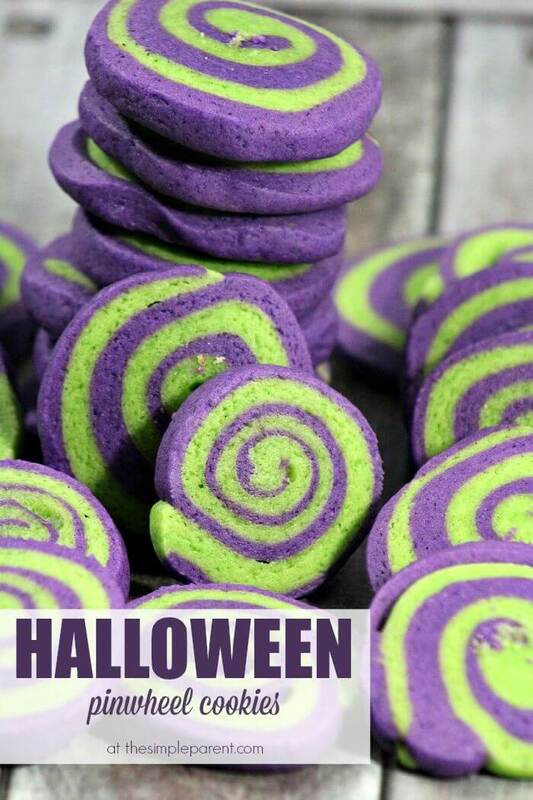 No one can help, but be hypnotized by these pinwheel cookies in signature Halloween colors. What’s Halloween without our very own Pumpkin King? These macarons are not technically cookies, but a little bit of variation isn’t bad, right? 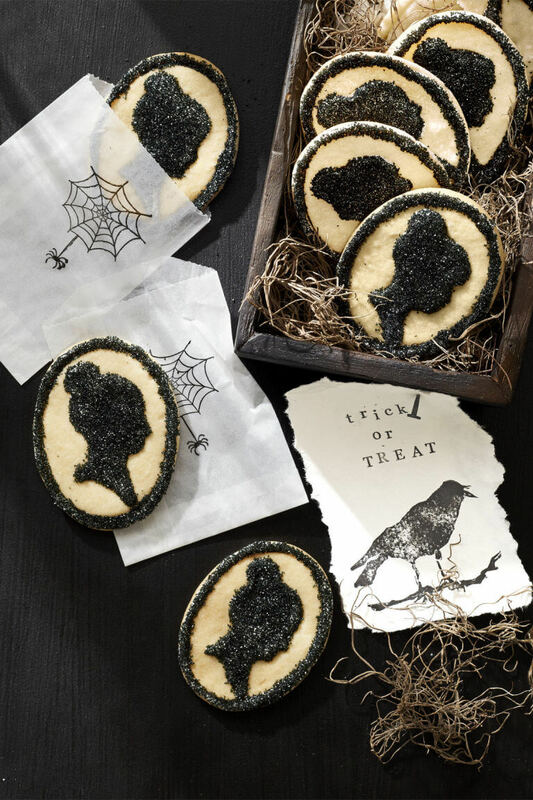 These cookies are so beautiful that they’ll even work as Halloween party favors. 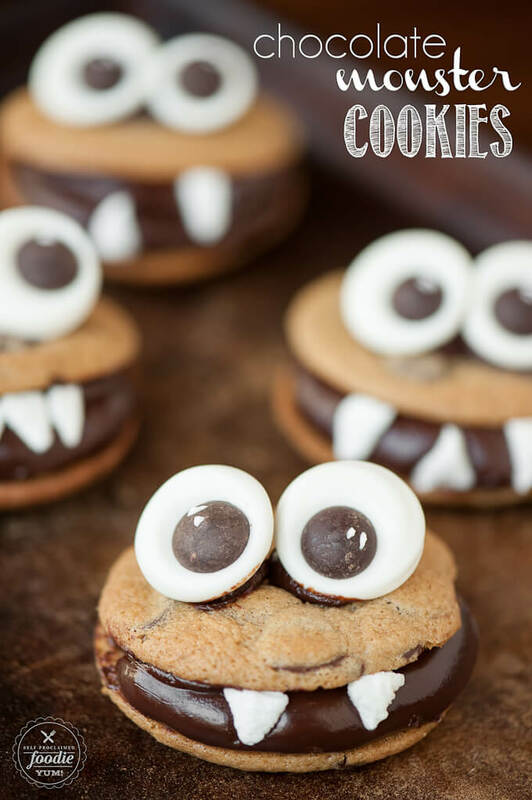 To create these cute and delicious cookies, pipe some buttercream between two chocolate cookies and make the teeth and eyes. 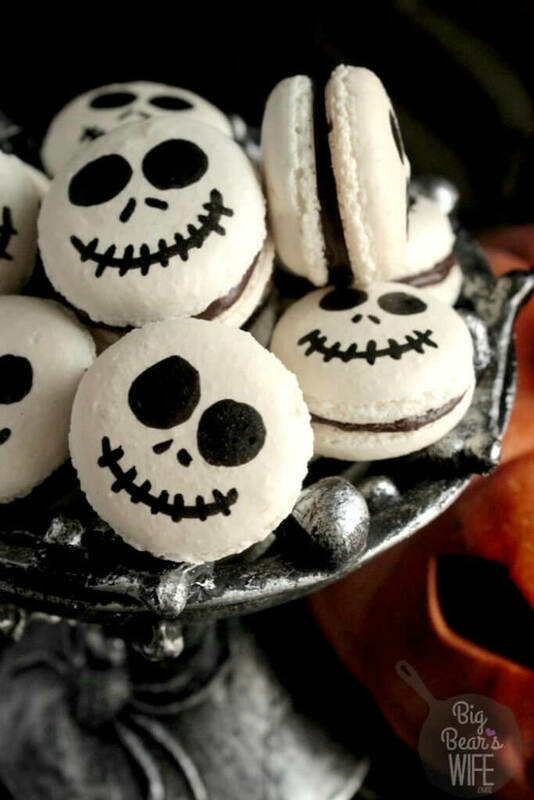 They may look scary, but are incredibly delicious. 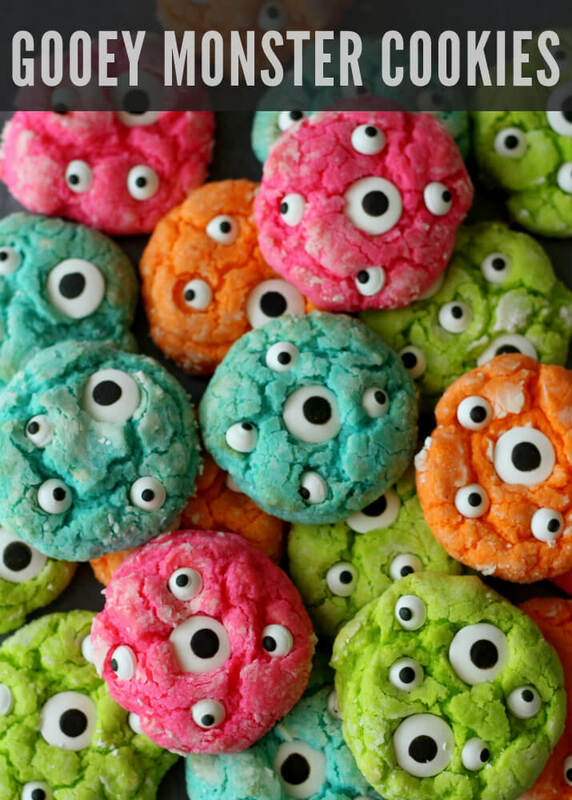 Big and small sized googly eyes are used to create these colorful, fun looking and gooey cookies. And believe me, they’re extremely easy to make. It’s been proven time and again that nothing says fun more than sprinkles. So why not incorporate them in your cookies as well! These Halloween special cookies give you loads of option for you to use them. 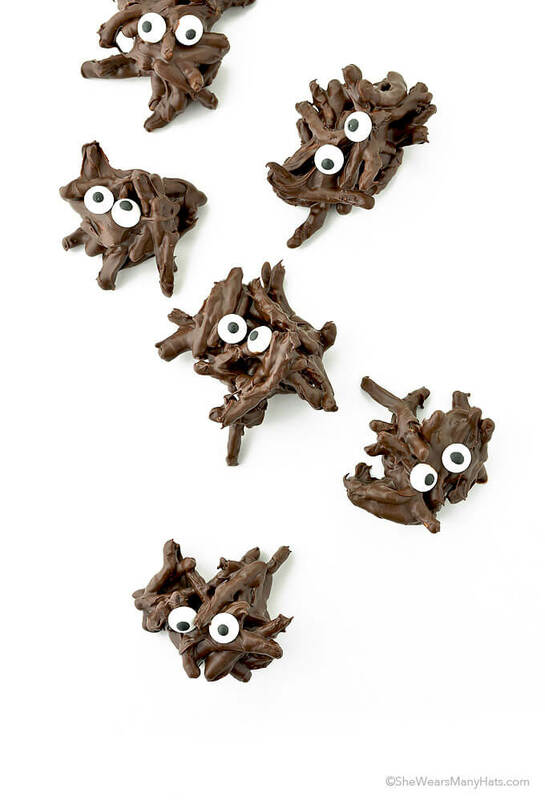 These chocolate monster cookies are extremely delicious to eat and fun to decorate. Just ensure that the chocolate ganache is perfectly made. It’s the most important component in this recipe. If you’re confused between cookies and cake, then we have a perfect option for you, this chocolate chip cookie cake. The candy corns are making beautiful toppings. The light and air wrapped wonders require just 4 ingredients. Trust me, they’ll completely melt in your mouth. 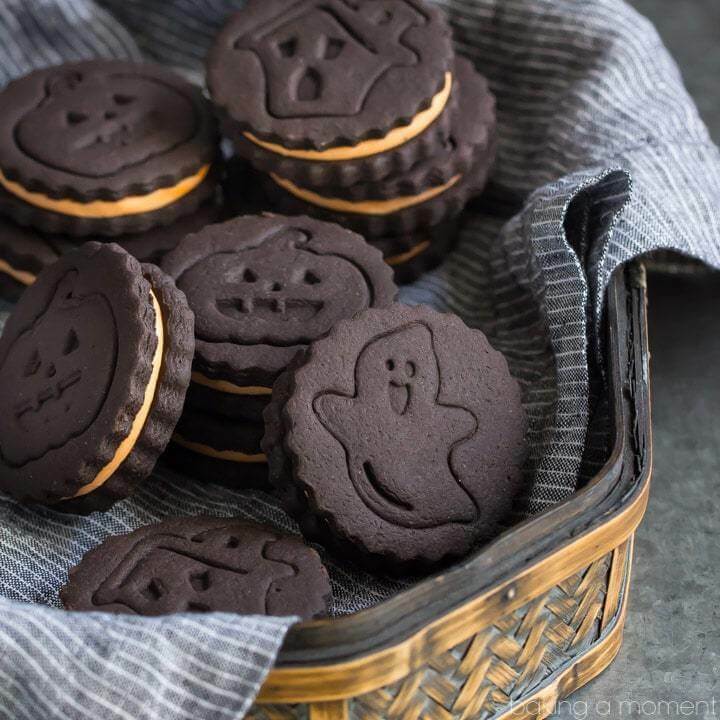 These cookies are the most mind blowing Halloween cookies we’ve come across in recent times. They’re like art, with all the neat lines. We’re totally giving it a try. 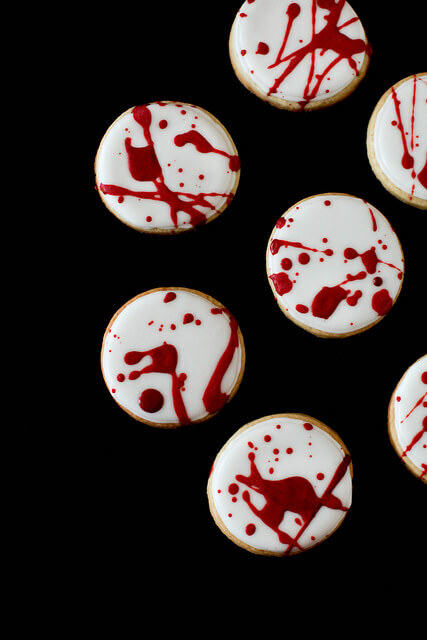 To make these creepy cookies, smear white royal icing on round sugar cookies and splatter some red icing on it. 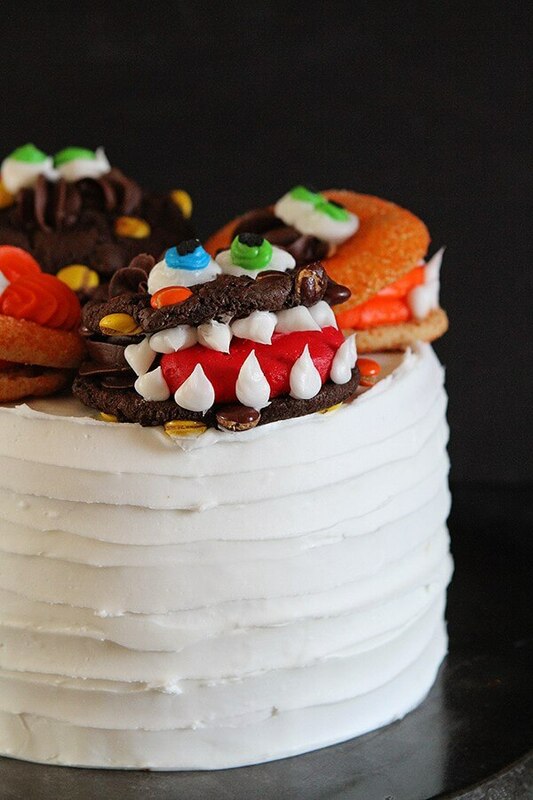 Here’s another example of Halloween cake, but this one’s a bit more colorful than the former. 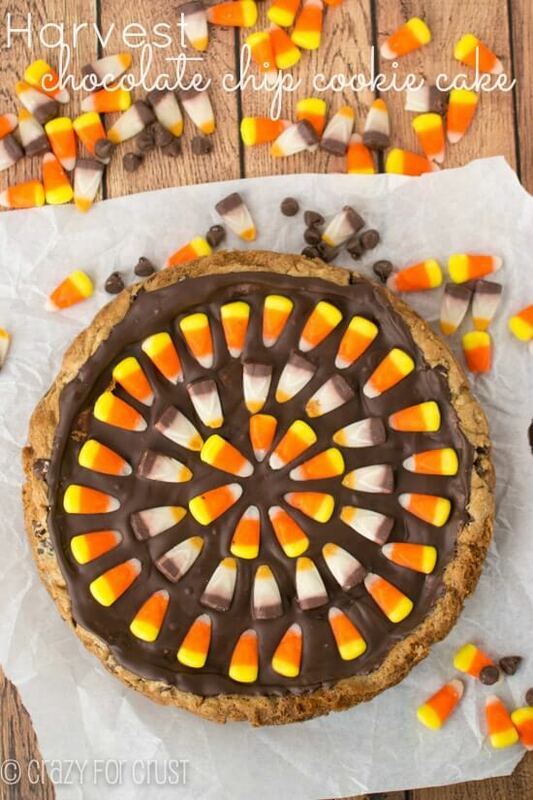 It’s topped with chocolate syrup, Rolos and Reese’s cups. 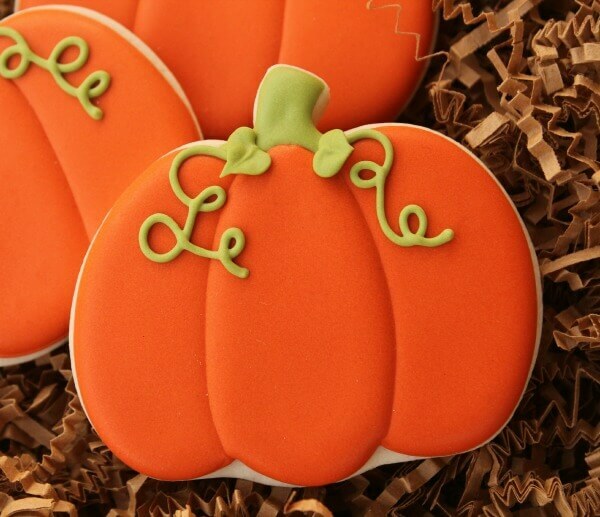 This beautiful pumpkin cookie will add warmth in the cold weather of fall. If you’re wondering how to make the leaves and vines, use piping. You’ll get the perfect finishing. 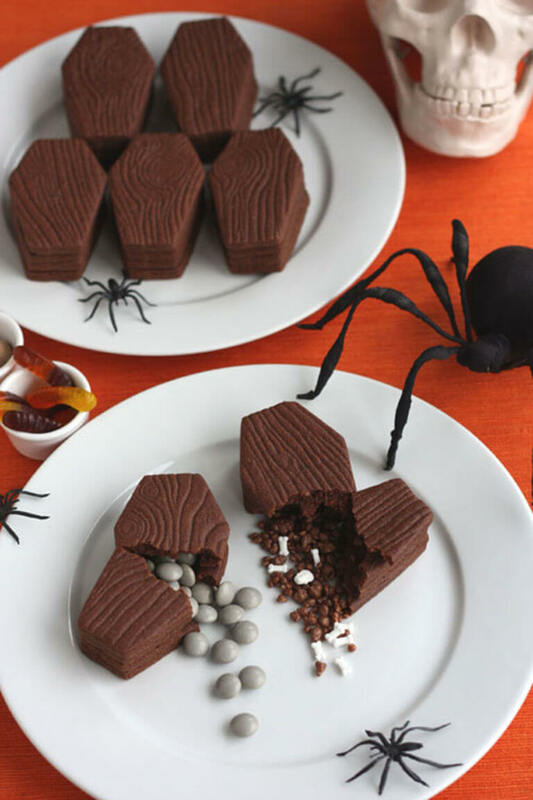 These spooky Halloween bites are sweet, delicious and will definitely please the crowd. So what are you waiting for? 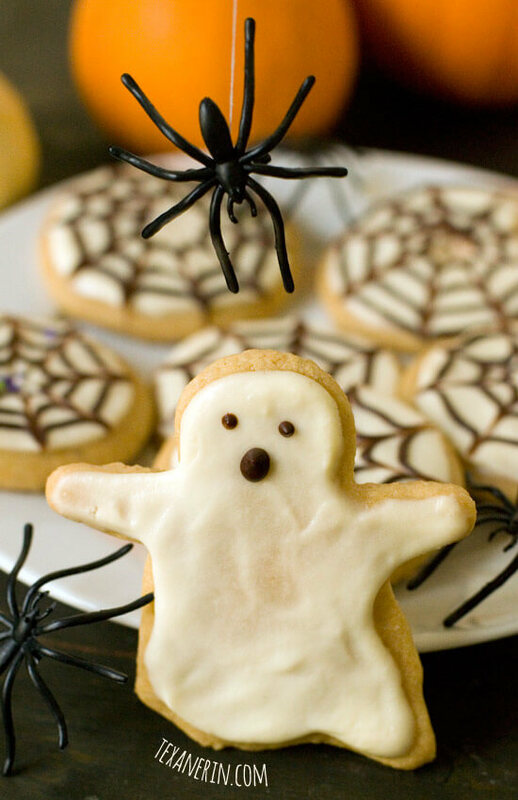 Make these Halloween cookie recipes right away. 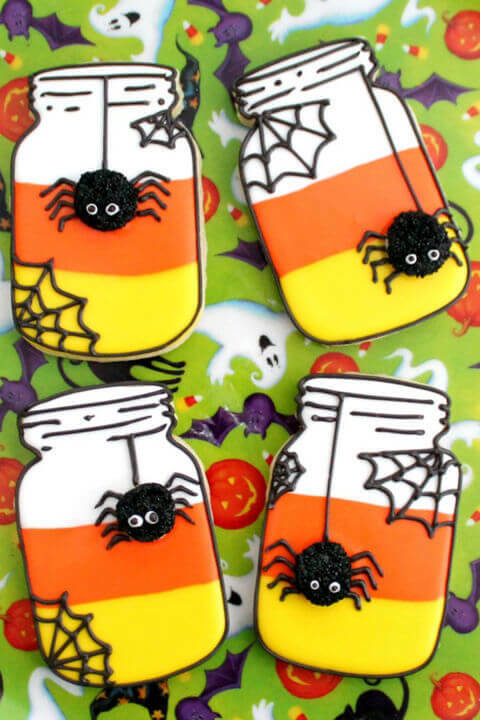 And don’t forget to share your favorite Halloween cookie recipe below.